STILL AVAILABLE! REWARD ! :$300 for info leading to a 10′ X 10′ studio space indoors or outside with access to bathroom, internet, and power. Free Radio Santa Cruz is also seeking a transmitter space where we can put up an antenna–a backyard, a multistory home, a high tree–help us spread the word. Help us so we can help you! 1 PM Monday April 22 City Sues Ross Camp in Dept. 5 at 701 Ocean St.
11 AM Wednesday April 24 Conscience and Action/HUFF meets either at Sub Rosa or at the Ross Camp itself to be announced. 6-8 PM Wednesday April 24 Community Dialogue on Ross Camp at the Resource for Non-Violence at 612 Ocean St.
Community and City Council Take Note!–Ross Camp Needs: Potable Water for Drinking and Grey Water for Washing, Laundry Access so Clothes Don’t Mildew, a Drainage System Against the Rains, More Space in Additional Spots. Support Food Not Bombs, the Warming Center’s 24 Hour Storage Program, HUFF, Conscience and Action, Monterey County Homeless Advocates, and other activists in documenting, providing resources, & publicizing the situation. Check out Ross Camp, The Santa Cruz Community, & Homeless Outside in Santa Cruz on Facebook for updates. Hear archived shows at http://www.huffsantacruz.org/Lostshows.html . Call in with street reports and commentary: 831-423-4833. If you must, expropriate items from chain stores. Don’t steal from vulnerable fellow homeless or local businesses! Conscience and Action meets at 11 AM; HUFF at 12; Sub Rosa will be doling out coffee and perhaps folks will bring edibles. Update on the $10 million from poverty pimps: News on the HEAP, HAP, or COC HQ. Any Progress on Emergency laundry and shower access for the broader homeless community and Ross or General Laundromat/Biz Discrimination? Push for Council Procedure Changes Proposed? Public Agenda Meetings ? Possible Update on Berkeley activists defending People’s Park against new attacks. Tenants in Trouble—demanding real data from Council’s Task Farce, organizing with students, renters, elderly, disabled groups to establish mutual power and solidarity. MHCAN report: HUFF movement to support restoration of services. Ross Camp Residents & Council Speak Out ! Back the Lawsuit ! No Homeless Bulldozing on April 17th ! +++ On 3-12, the entire City Council dumped its February 26th promise to postpone any closure of the Ross Camp until there was adequate shelter or safe sleeping space for the entire population there. +++ The Council’s “solution”: Set up shelter for 100 people at the boneyard & another spot. +++ The “solution” won’t shelter 100-200 Ross residents. It ignores the rest of the homeless population. +++ The overcrowded Ross camp needs overflow shelter and services now not an April 17th deadline. +++ Ross camp residents are preparing an Injunction with the assistance of attorney Anthony Prince of the California Homeless Union to force the City to respect the Martin v. Boise decision. Support the lawsuit! FOR THE GRAPHIC VERSION OF THIS FLYER, DOWNLOAD THE PDF ! Free Radio Santa Cruz still still offers a reward of $300 for info leading to a 10′ X 10′ studio space with bathroom, internet, and electrical access–either indoors or out (we’ll build a structure). We’re also seeking a transmitter space where we can put up an antenna–a backyard, a multistory home, a high tree–help us spread the word. Help us so we can help you! Beat Back the Bigots at City Hall ! NOTES BY NORSE: This article by Councilmember Glover and attached commentary gives some important background on the evening session coming up at City Council for Tuesday night. A speak-out and protest outside Council chambers will begin at 6:15 PM with food supplied by Jumbogumbo Joe Schultz of India Joze. Originally, the protest was intended to focus on continued harassment by SCPD and P & R rangers harassing and citing homeless folks in public places, with some reports that folks living in their own camps were being driven to the Ross Camp. Though the Ross Camp has been provided with some more (but still inadequate) facilities in the last month, it is still badly overcrowded and under severe pressure from raging neighbors. In response, HUFF called for additional campgrounds, laundry and shower services, and the end to citations for being in a park after dark, reopening public bathrooms during the day and at night city-wide, and protecting the rights of those whose homes are their vehicles. Councilmembers Glover and Krohn were rebuffed on rent control/just eviction and then by the City Manager and Mayor Watkins for not putting homelessness on the last January Council meeting. In response, Glover mobilized his interns to propose 6 measures in consultation with homeless activists, and folks from Ross Camp and the RV community itemized in the PDF’s attached to his Indybay story “The Fierce Urgency of Now”. Glover and Krohn may have a 4-person majority on City Council not just to pass the homelessness resolutions, but also to rein in Mayor “One Minute” Martine Watkins censorship proclivities which were in full foul flower at the last Council meeting. Speaking times were reduced to one minute, speakers were excluded, speakers were interrupted, and oral communications was crunched and contracted in her desire to “welcome” a foreign delegation from Japan. There was little protest if any from the “Progressives” at the January meetings. Unless members of the audience demand it vocally, there’s no guarantee we won’t see a repeat of this disgraceful performance on February 12th. Folks need to come in numbers, ready to speak out, unroll sleeping bags, hold up signs, and stand their ground. Note that there is no mention of rent control or just eviction, just a fig leaf proposal for yet another Task Force that will babble while tenants and their supporters get driven out of town. Review Glover’s article and the attached documents. Check also the “Flyer for 2-10-19 City Council Protest” which gives more details. Come on down to City Council on Tuesday at 6:15 PM. Form connections with folks at the Ross Campground. Contact City Council by e-mail (citycouncil@cityofsantacruz.com )or phone (831-420-5020) . And contact HUFF at 423-4833 or rnorse3@hotmail..com to be advised of upcoming flash protests and to resist the demolition of the Ross Campground. Story continues at https://www.indybay.org/newsitems/2019/02/08/18821045.php and the comments that follow. SURVIVING IN YOUR VEHICLE…-BUT HAVING HARASSMENT PROBLEMS? Rally and Press Conference at the Santa Cruz Police Station Fountain Area Thursday January 10th 1:30 PM 155 Center St. at corner of Laurel St.
Are you being pressured or threatened to move your vehicle more frequently than the legal resting period of 72 hours? Are strange chalk marks appearing on your tires? Are hostile housed locals suggesting you have no right to park on the public streets? Are you awakened by rude pounding, shouting, and banging in the dead of night? Is your family or loved one being made to feel unwelcome in a neighborhood in which you’ve parked for less than 72 hours? +++ Come and tell the community what’s been happening to you and your family. +++ Share suggestions and advice on “smart survival tactics”, “diplomatic camping”, and an appreciation of your rights and responsibilities as a car camper. +++ Demand the new City Council and Police Chief Andy Mills direct officers to follow the law Chief Mills has agreed to be present to answer questions and concerns. 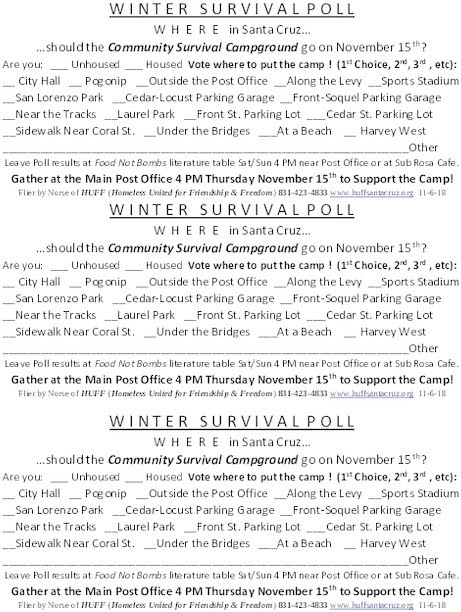 This poll was distributed yesterday at the Red Church meal and will be made available to unhoused (and housed) folks throughout the City to provide input for the march on November 15th to begin at the Town Clock and lead to a Campsite. You may also e-mail your vote to rnorse3 [at] hotmail.com or leave it at the Food Not Bombs literature table Sat/Sun 4-6 PM just outside the main Post Office fence or at the Sub Rosa Cafe at 703 Pacific Ave. when it’s open. A detailed account of the last year’s slitherings of the City Council and staff to present the illusion of shelter which actually covers only a small fraction of those outside in Santa Cruz. And even less this winter than last winter. Santa Cruz awarded $3.3 million for homeless…Closes the River Street Camp and pubic parks? 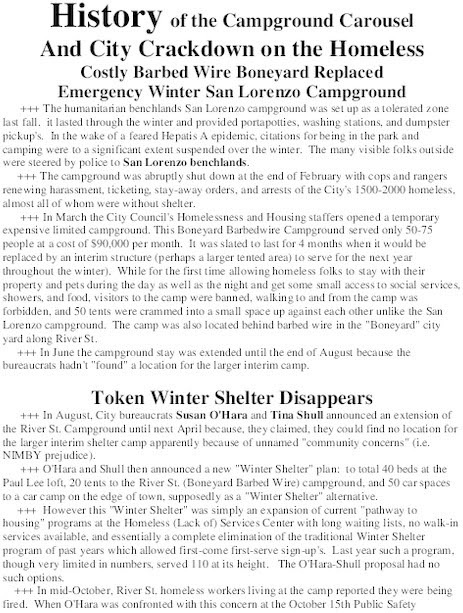 On October 17th, Sentinel journalist, Jessica York, reported that the River Street Campground will be shut down in November, with some of its members relocated into a scaled down Winter Shelter program at the VFW Hall on 7th Avenue. The VFW site will sleep 60 people and open only during evening hours, with a first-come, first-served model that does not allow pets and has limited possession storage. 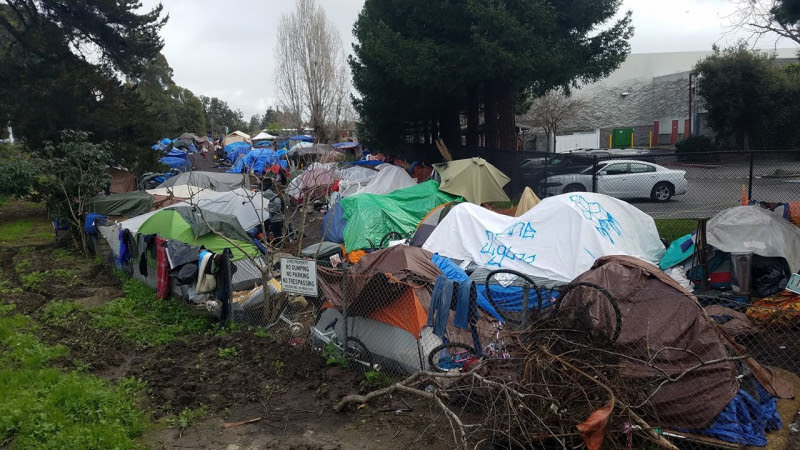 On the same day that the Sentinel announced the closing of the River Street Campground city officials fenced off San Lorenzo and Grant Street Parks, closed its bathrooms and posted signs saying “PARK CLOSED Until further notice for – Focused Maintenance – Public Safety”. Workers started to replace the fence at the Post Office with a permanent iron fence on Monday, October 22, 2018. Private security guards were busy rousting homeless people from the San Lorenzo telling them to cross the river into downtown. The city has already fenced off Garfield, Star of the Sea, and Laurel Parks, closed the Louden Nelson bathrooms and is stepping up harassment of those without housing seeking a place to rest downtown. Santa Cruz currently has no walk-in shelter with long waiting lists for programs at the Homeless Services Center. Police and rangers are also violating the Martin v. City of Boise – Ninth Circuit Court of Appeals ruling against ticketing and arresting people who have no place to sleep subjecting local homeless community members to what the court says is cruel and unusual punishment. The waiting list at the River Street Shelter is closed. The County of Santa Cruz was just awarded $3.3 million in State and federal grants to help house homeless individuals and families yet few are being housed and instead they are being fenced out of public space.